With its excellent parameters, high quality and low weight, trekking shoes SNOW TRACK are perfect for trekking and hiking, hunting and fishing, and city trail. It is the perfect shoe for stable leg comfort in bad mountain conditions as well as light waking in the city. Durable, comfortable, stable on slippery or difficult terrain, waterproof, breathable for long walking. Made of high quality materials SNOW TRACK hiking boots are ideal for trekking in the lower mountain, mixed routes, flat terrain and around the river or lake. 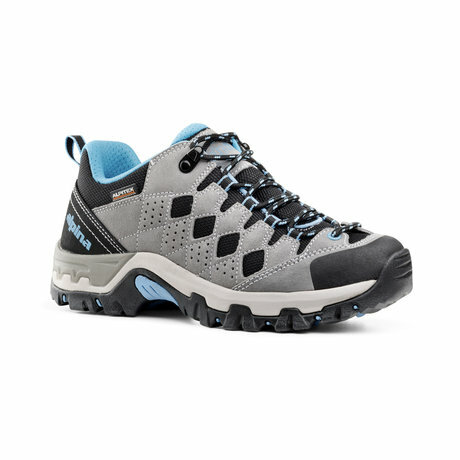 Lightweight hiking shoes for light and medium transition. Extremely suitable for hunters as they are waterproof and breathable. Suitable for field walking and mountain hiking, as well as moist areas. The outer material - split leather 2 mm and waterproof and breathable membrane Alpitex ® are optimal combination of breathing and insulation which ensure comfort feet whatever the conditions. Sole Vibram is designed to achieve maximum functionality, security, comfort and stability. The size, shape and location of the outsole ensure excellent traction when walking on wet, dry, slippery or rough terrain. Special form of gripple under the heel ensures easy braking on steep slopes. Under the fingers grapple is also designed to contribute to better grip when climbing rocky terrain. The grooves between the tread allow water and mud to flap, as a result, the sole remains clean and does not reduce adhesion to the ground. Effective additional protection of the shoe from rocks and bumps. Natural leather for heel reinforcement. THINSULATE INSULATION SYSTEM Compared to standard boot linings, the Thinsulate insulation system guarantees conditions for the feet that are twice as warm as other boots. The feet can breathe and regulate the natural physical feeling of the foot. Consequently they stay warm even in unusually wet weather conditions. VCP - Volume Control Plate - Special insert made out of natural material for fit and volume engagement. If you take out the plate the shoe has bigger volume. Expanded PU midsole for soft and comfortable walking.